Queens Brian May nutzte lange Zeit den mit Germanium Transistor ausgestatteten Dallas Arbiter Rangemaster vor seinen AC30 Amps, wechselte in den 70ern aber auf eine Version mit Silizium Transistor, um mehr Biss zu bekommen. Dies ist die Neuausgabe seines Silizium Boosters, ohne den sein Signature Tone nicht denkbar wäre. Beim BM-Q Special handelt es sich um die Ausführung ohne Lautstärke-Regler. Brian May from Queen used in his early days the British Range Master Germanium Treble Booster, a unit produced between 1965 and 1969. This model is rebuild as RM by BSM. 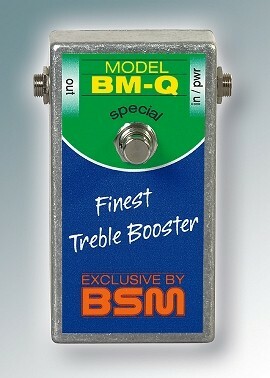 In mid-phase from Queen, BrianMay switched to a silicon Treble Booster design for more bite, now reproduced by BSM with orginal silicon transistor and called BM-Q special. The same unit fitted with volume control called BM-Q. It is also of interest to note that Brian May used a couple of VOX AC30 combos with the BM-Q in front of the "Normal" channel by volume setting three quarter of full. 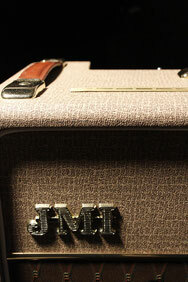 If you don´t have an AC-30 amp, you can simulate the behaviour of it´s CLEAN channel with any other tube amp by plugging in your axe into the NORMAL channel + cutting down the TREBLE pot while open the MID pot all the way up. Adjust the BASS control to your own preferences and you are done.